Kung Po Chicken is a common dish found in most, if not all, chinese restaurants. 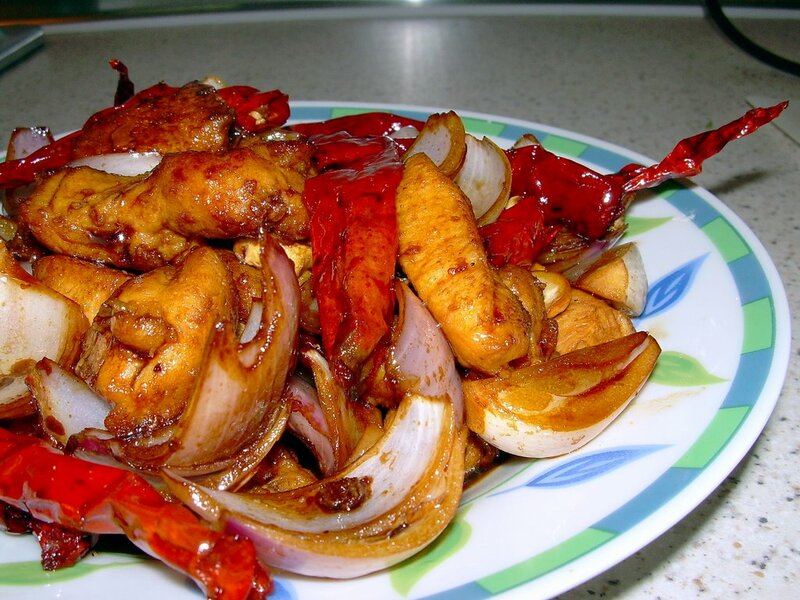 This dish is basically diced chicken stir-fried with onions, dried chillies, cashew nuts and capsicum. Some even add water chestnuts to the dish. 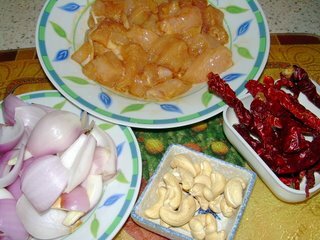 The aroma from the chicken which was marinated with chinese cooking wine blends well with the spiciness of the dried chillis. Meanwhile, the tender bits of chicken meat is contrasted with the crunchiness of the capsicum and onions. The cashew nuts lend a natural sweetness to the dish. Anyway, I am not that good expressing how a dish tastes like, so I shall keep it short and simple. This dish is best eaten with plain white rice so that you can savour the full taste and aroma of the dish. Some have substituted the chicken with cuttlefish, which is quite a good alternative. In my recipe, I have simplified the dish to my own liking. I have omitted the use of the capsicum and perhaps, the sauce is a bit different from the original recipes by professional cooks. However, I am still confident that you will like this dish if you try it out. This is my recipe for Kung Po Chicken. Marinade chicken cubes for at least 1 hour. Heat oil in wok on high. Fry chicken cubes till golden brown. Remove from oil and place aside. Remove cooking oil from wok leaving about 1 tablespoon in the wok. 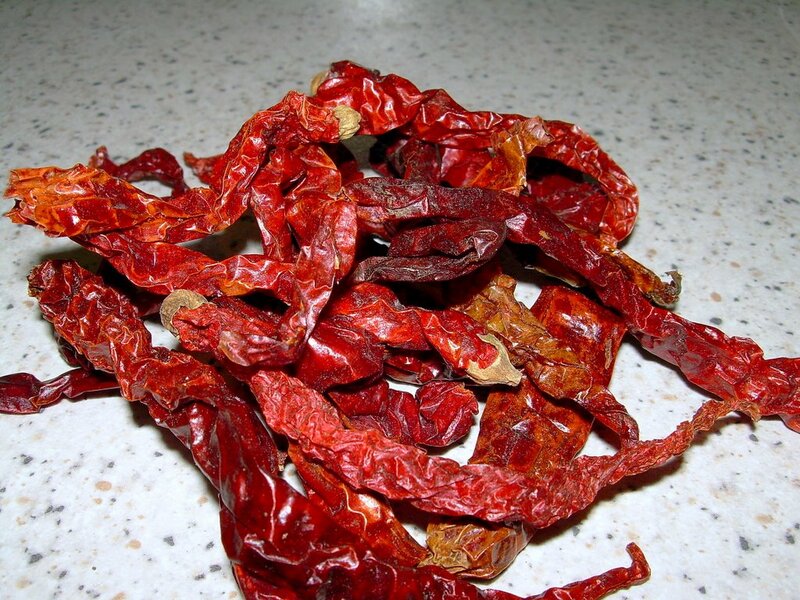 Add onions and dried chillis and stir-fry for 30 seconds to bring out the aroma. (If you wish to add capsicums which are cut into cube sizes, add them at this stage) Add pre-fried chicken cubes and cashew nuts and stir well for a minute. Add seasoning and 1/2 cup water and close lid. Stir occasionally till water / gravy reduced by half. I would deep fry or toast the cashew nuts first to make them crispy. I posted a similar dish before, and it’s called Cashew Nut Chicken, cos I did not have dried chillies or onions (to make it Kung Pao Chicken)!